An auditor oversight account is a Showbie account that allows full insight into what is occurring in all classes at their school by adding the account holder as a co-teacher to all of the school’s active classes. Auditor oversight accounts are free and available upon request to all Showbie Pro schools. While recently attending Bett in London, the Showbie team received feedback from Ingeborg Gude at Baerum Kommune in Norway that some tweaks to auditor oversight accounts could take the feature from good to great. We were all ears. In a large kommune like Baerum, there are hundreds of classes and assignments, so finding a specific class or assignment can be challenging for auditor account holders. 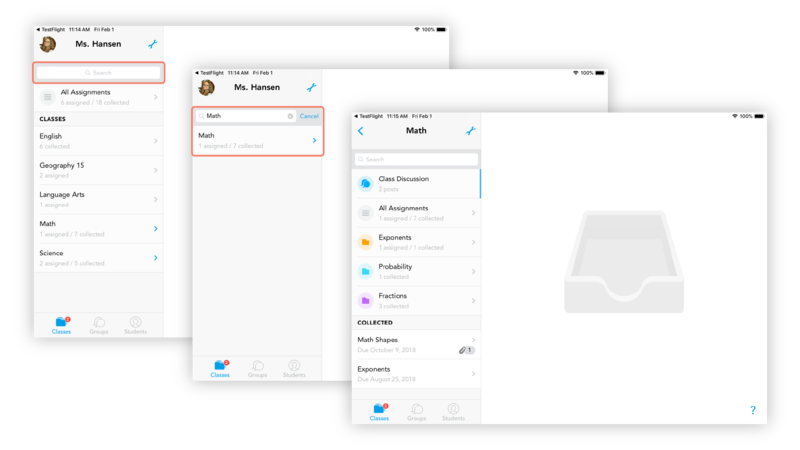 Based on this feedback, we have added search capabilities to all listing screens in Showbie, in addition to the search capabilities that already existed on the All Assignments and Students lists. This means search is now available on Classes, Class Contents, Assignments (both All Assignments and assignments within Folders), Groups, Student Folders, and Students. This search capability is especially useful for auditor account holders, who often have a large number of classes and assignments. This feature is currently available on our iOS app, but we will be adding it to the web app in the near future. In order to ensure Classes are easy to search, we recommend developing a school-wide naming system, including the subject and grade level. Auditor oversight is one of many services we offer to Showbie Pro schools. Find a full listing of services here. To sign up for auditor oversight or any other Pro service, sign in to your Admin Dashboard account and click the Admin Tools button.